Read some comments from guests who have taken tours and safaris with us. These are just a few selected. More upon request. We have many that we could quote. 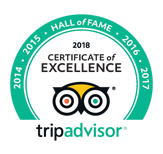 And we invite you to make a comment either via Trip Advisor or our Guest Book so that you can share your experience with others too. Glen and Susan were great! They were very friendly, positive and full of energy. They picked me up on time (4am for hot air balloon safari!!) and everything was smooth as scheduled. Pilanesburg is an amazing place, the Bakubung Bush Lodge that I stayed at was very comfortable. I really enjoyed my trip. Thank you, guys! I highly recommend anyone who has a busy holiday schedule in South Africa take the GO Safari one day trip. Glen is a very knowledgeable and patient man who will go the extra mile to ensure you enjoy every expect of the game park and he is also a great historian who will tell you almost everything you need and want to know about South Africa's geological history. He is also well connected with the other Big One (the Diamond) in South Africa where you will finish the whole South Africa journey with a big smile!!! Our day spent at Pilanesburg and the lunch exceeded our expectations, it was fantastic. We saw four of the big five. We were really glad we made the effort to go! The only downside was the transport to the park, we were last to be picked up, ended up at the back of the van! The rear seats were upright, very uncomfortable. Nobody was willing to change seats for the journey back to the hotel. Dear all, thanks for the great organization of the safari trip last weekend. I would like to highlight that Pierre Harris is an excellent guide with the right level of connecting with the guest as well as acknowledging privacy. I felt very safe during the trip and was able to ask any question, which were at the same time patiently answered by Pierre. Booking tour package with Go Safari is a "peace of mind". Susan and Glen are very courteous and effective on their job. Thank you for the wonderful vacation with no problems at all. Dear Susan and Glen, Thank you for organising an overnight stay trip to Pilanesberg National Park Bakubung Bush Lodge. I was in good hands. Everything was really fine. If I come back to SA I will contact you again to get things organised. Remain as you are. Go Safari helped us arranged everything and made our experience comfortable at the Bakubung Bush Lodge. So glad we signed up for this, we checked so many animals off our list! They booked the drives and we were lucky our stay coincided with the bush braai at night, making it one of the highlights of the stay. Go Safari is always easily contactable via email and they sent friendly drivers for our transfers. Our first and definitely not the last safari experience! My family and I had a lovely stay at the Bakubung lodge in the Pilanesburg Park. Hotel room was nice, good food, great facilities for the children, and we saw so many animals... we were very lucky. Would highly recommend. We did the 1-day Safari at Pilanesberg. Go Safari picked us up at our hotel. Our driver/guide Wiggie was amazing! It was more like a fun road trip with friends. Wiggie was very knowledgeable and provided lots of information and history of Joburg and the park. He was professional, funny, and such a gentleman. I highly recommend Go Safari and Wiggie.